It’s Shark Week! Since the late 80s, the Discovery Channel has dedicated a week-long block of television to shark-themed content. Over the past few years, Shark week has grown in popularity, reaching over seventy two countries worldwide and this year did not disappoint. 28-time Olympic Gold Medal winner Michael Phelps raced a great white shark. You read that right. The world record holder was seeking new heights and raced a shark! Well to be fair, the shark was CGI, but it was still fun to watch. If you haven’t seen the footage yet, check out the Discovery Channel link. In the episode Phelps said, “I am a person who thinks, if you put you mind to anything you can achieve anything.” SPOILER, Michael did not beat the fictional shark, but it was very close. For many individuals, I think there are times where they see their career as a race to the top. Moving up, and taking on senior positions is the only goal they have in sight. Sometimes that race is won easily. Other times, that vertical is a 20 foot great white shark. You can be the best performer in your company, but you just can’t beat the reality that vertical options are difficult to conquer. 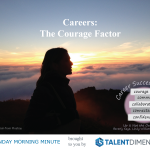 Think about where you are in your career today? Do you find yourself chasing the shark that is career advancement? With co-authors Lindy Williams and Lynn Cowart, I recently wrote a book titled, Up is Not the Only Way: Rethinking Career Mobility. In the book we address the reality that Up is Not the Only Way! 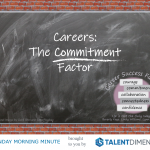 We talk about six ways to build your career. Your career is not a race. It is a pathway that has twists, turns, may travel up, or sometimes take dips. In your career, you need to be the great white shark. Great white sharks, do not typically swim quickly over long distances. They are not racing for their goal (which is usually a meal), they move steadily through the water. They are strategic and precise with their movements. They cannot charge through the water without direction, or all the other fish would stay hidden from them. Likewise, you need to be strategic with your career moves. You need to work smart, and make every move make sense for your life and career. Also, because their gills do not have a natural pumping system, they cannot stop swimming forward, or they drown. Success takes time, and it requires you to keep going, always moving forward, and always adjusting to your environment. If you stay the course, you will always come out the winner. Pre-order your copy of Up is Not the Only Way: Rethinking Career Mobility.